David Cox has a birthday today. David Cox changed profile picture. David Cox added a photo to profile gallery. 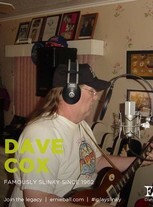 David Cox updated profile. View. Bertie Higgins,Ralph Anzivino, Dave Cox. Dave doing sound check for Bertie Higgins Band!! Joyce Cox, Bertie Higgins, Dave Cox be for concert in Tarpon Springs, Florida.